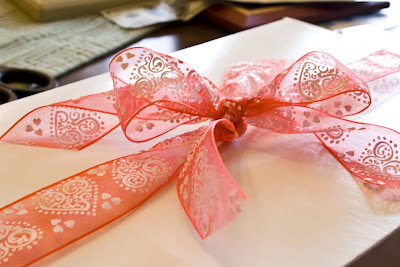 My friend Lizzy invited me to her "First Annual Bloggy Friends V-Day E-Party". 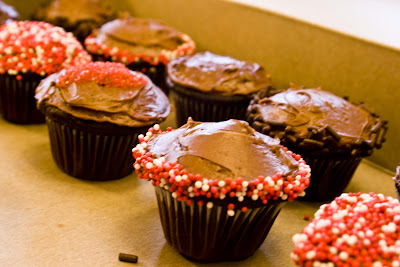 She had the fantastic idea that we should all bake some V-Day treats, take pictures, and post them on the blog. 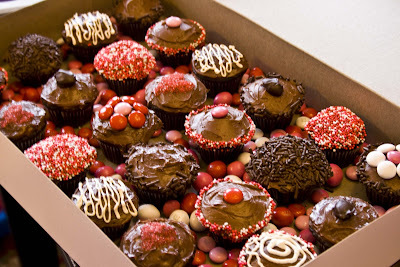 She has promised to post all the treat photos on her blog for the big day. This was super fun! I have become obsessed with my new cookbook Hello, Cupcake! This book has SO many adorable cupcake ideas, I thought I'd give them a shot for the Bloggy Friends party. 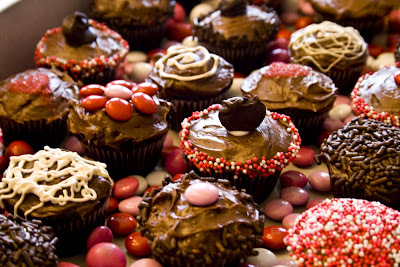 Before you go thinking I have too much time on my hands, let me tell you that these cupcakes are so easy. The decorating only took an hour. Based on most of my past baking projects, this one was as easy as (or, I should say easier than) pie. Ha ha! And people, Nicole was able to accomplish this even while being interrupted with a phone call.